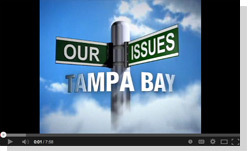 Jen Holloway-Professional Tampa, Florida base news anchor. Knowledgeable on-camera talent with extensive experience in live network news, infomercials, corporate promotional videos, and commercials. Jennifer Holloway has an extensive and diverse career in news broadcasting, voice overs, commercials, infomercials and modeling. Among her many accomplishments she also is very active with different charities in her community. Jenn graduated with a degree in Journalism from Kennesaw State University in Atlanta. She also started her broadcast career in Atlanta at WTLK TV-14 as host of the city's only week night, live, entertainment program. After Atlanta, Jenn worked at KPRC Channel 2 in Houston, TX for a couple of years.....then on to Tampa Bay. Jenn worked at the morning news anchor for Bay News 9 for over seven years. Recently Jen joined Great 38 as TV producer and host. Jenn's very own invention was featured on Everyday Edisons in July 2007! Everyday Edisons documents seven inventors selected from thousands as their inventions are taken from a sketch on a napkin to store shelves. Jenn is an active volunteer and fund-raiser for The PACE Center for Girls, All Children's Hospital, The Children's Home, Easter Seals of Tampa Bay, PARC, Gulf Coast Giving and Autism Speaks. Jenn also sits on the Board of Directors for St. Petersburg General Hospital, The Boys and Girls Club, Crime Stoppers of Pinellas County and The Big Brothers Big Sisters Marketing Committee. Click here for videos of Jenn on Great 38.
as TV Producer/Host of Great 38TV.